Just a 35-minute ferry ride to the east of Auckland lies Waiheke Island, comprised of rolling green hills and picturesque beaches. This description may sound like the lyrics to a folk song, which is fitting, as the island has a very alternative feel to it – writers, artists and poets are well represented among the (close to) 8,000 permanent residents on Waiheke. Situated in the Hauraki Gulf, Waiheke’s microclimate, combined with its unique soil, makes the island an ideal place to grow grapes and it is home to more than 30 wineries and a couple of olive groves. Not normally ones for organised tours, all we’d seen in 3 days was the inside of Auckland’s bars, so we decided that something touristy was in order before heading back home across the ditch. We made it to several wineries on our tour of the island, including Wild on Waiheke, which caters to both tourists and corporate clients through activities such as tasting their ‘Topknot Hill’ range of wine, clay bird shooting and archery. 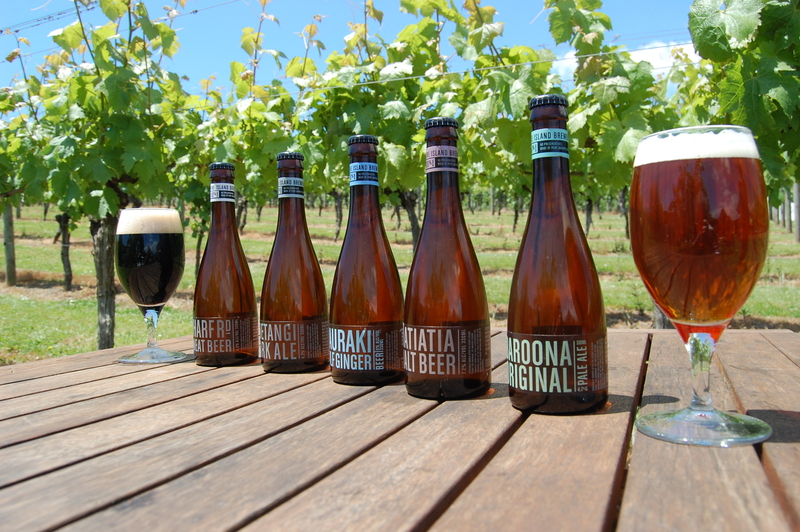 The brewery has been operating since 1998 and currently produces 4 beers – in order of our own preference: Matiatia Malt Beer, Onetangi Dark Ale, Baroona Original and Wharf Rd Wheat Beer. Anyone familiar with Moo Brew in Tasmania may recognise the bottles and Waiheke Island Brewery continues the trend of great beer being crafted in an island setting. We also had the chance to ‘Taste Waiheke’, with plenty of local produce on offer and we would have brought back a carton of Coriander Chili Lime Salsa if not for hand luggage restrictions. Our brief stop at Wild on Waiheke was capped off with a decent sized glass of Wild Days Rum, which is also produced on Waiheke Island and apparently goes pretty well with the (non-alcoholic) Hauraki Gulf Ginger Beer.